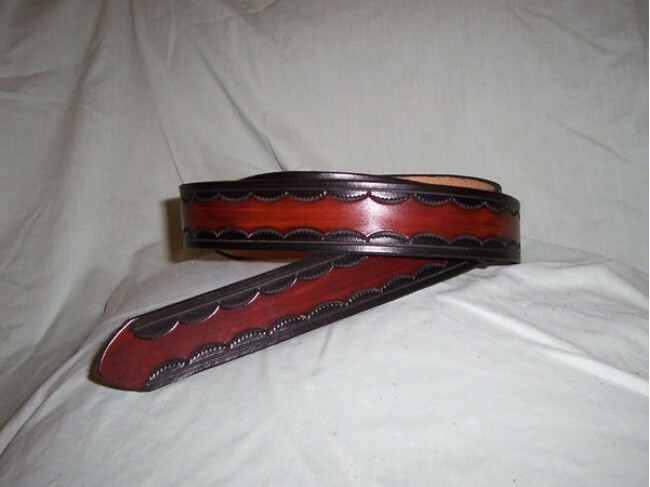 The Professional Design is an American Custom Leather signature belt with distinct tooled patterns lining the outside edges of the belt exposing the middle color of your choice. The Professional belt wears great with dress slacks or khakis. You choose 1 of 3 sizes of belt widths. You choose the color. Shown 1 1/2" Black/Brown. Belt Length --- Please Select --- 24" 26" 28" 30" 32" 34" 36" 38" 40" 42" 44" 46" 48" 50" 52" 54" 56" 58" 60"
Belt Width --- Please Select --- 1-1/4" 1-1/2" 1-3/4"